What’s the first things everyone thinks of, when thinking about Basements? Basements smell musty, and they leak. You need a sump-pump, which is loud, and can fail. Well: No, Yes, and No. 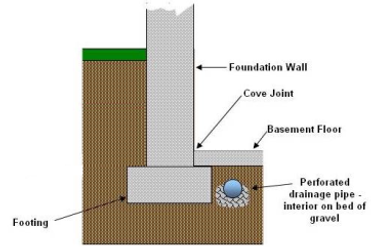 No: Digging a trench to the Footing from outside the wall is NOT the ‘only way’ to fix basement flooding. NO MORE LEAKS! Say Goodbye to your old Shop-Vac! We jackhammer the perimeter of your basement wall, approximately 12″ from the wall. Then we dig-down 5-6″ below the basement floor, clearing any loose dirt in the trench. Then we install the drainage matting, then lay-down a bed of drain rock gravel and put the perforated drain-pipe on that. The reason we do this, is to help keep dirt particles/etc from clogging the drain pipe… instead, dirt particles/etc will stay in the gravel. And finally- we install top-of-the-line Zoeller cast-iron pumps , which are both very quiet (especially when the Sump Liner lid is attached firmly), and last for many, many years.